Glistening from afar, Informal is prettily ensconced in the bohemian-chic, kitschy streets of downtown Janpath. Step into Informal, and you’ll immediately be confronted with a mile-long, rustic, scavenged-looking bar, just waiting to whip up delightful cocktails at a moment’s notice! And so we did! So here&apos;s all our foodie sojourn - read on. After being comfortably seated in the many patched-leather armchairs littering Informal, we asked them what would be the perfect cocktail to start our evening with, and they promptly placed a little saucer containing golgappas, along with a test-tube-jar of golgappa juice in front of us! 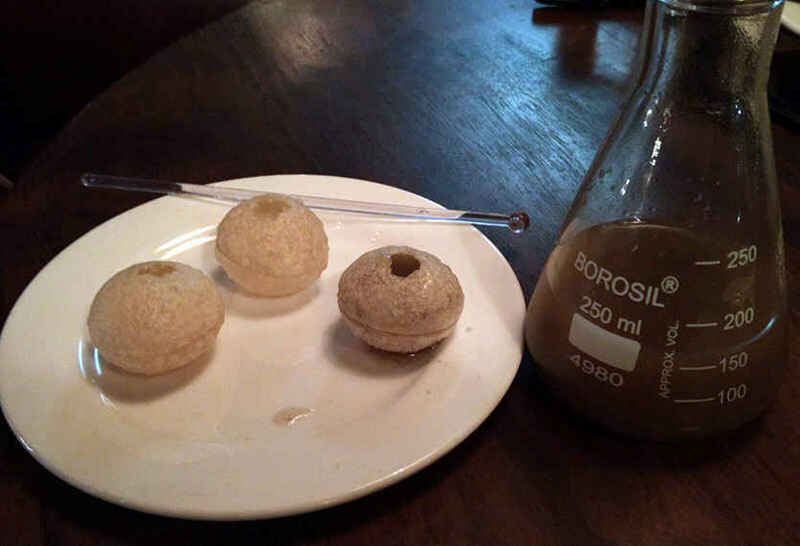 We all know what that means - yep - Golgappa Shots! Absolutely soaked with vodka, these little puffs of spice-filled riot were the most tasty thing we’ve eaten (or rather drunk) in quite a while! 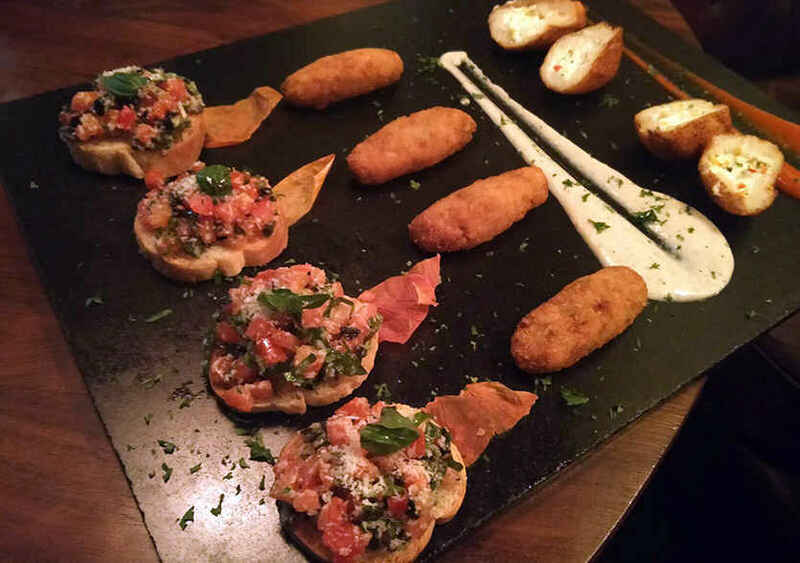 Their Vegetarian Platter consisted of veggie paradises like their Mediterranean Bruschetta - their bruschetta was the most refreshing thing you’ll pop into your mouth! It was springy, crunchy, topped with heaps of juicy, fat black olives, zesty, chopped tomatoes and garnished with sweet basil. Still in veggie-land, we then sampled a little something called Vegetable Croquetas - a creamy, juicy delight, absolutely packed with lots of portuguese mushrooms minced to perfection and absolutely slathered with the finest parmesan and mozzarella cheese. The perfect cocktail snack to just about any drink in your hand is our verdict! 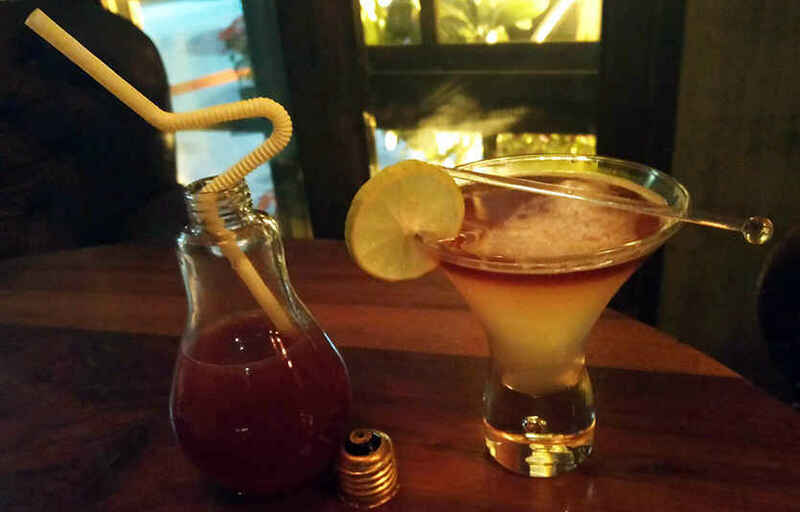 While munching on these delights, we sipped on this great new drink, cutely called the Candy Garden. A swirly mix of dollops of vodka, peach liqueur, some red wine - all stirred to perfection! As you can imagine, it was refreshingly zesty, fruity and packed quite a punch - beats a regular-joe cosmo or bellini any day! 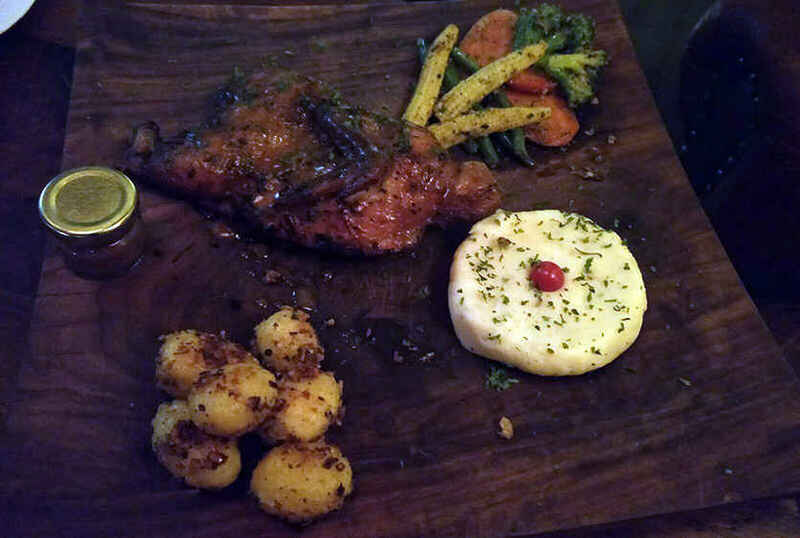 Since we really couldn’t pretend to be herbivores any longer, we then begged for a heaping helping of some meat, and were presented with their Non-Veg Platter! This huge platter was laden with their patent Smoked Chicken Lollipop, which were essentially massive chicken wings, char-grilled and smoked to a T and cooked with a medley of herbs such as thyme, rosemary and lots of garlic. What you get - satiation guaranteed! 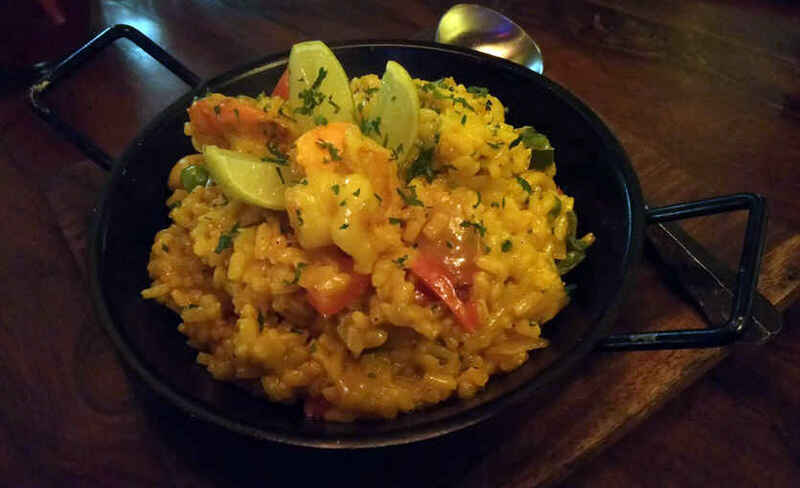 Shoving chicken and ham aside, we were then regaled with Seafood Paella, a thoroughly innovative dish this, it’s a risotto-style, soaked bowl of arborio rice absolutely brimming with no end of prawn shrimp and masses of calamari (yay!). Here’s what we’re saying about this - you literally cannot stop digging your fork into this one again and again! 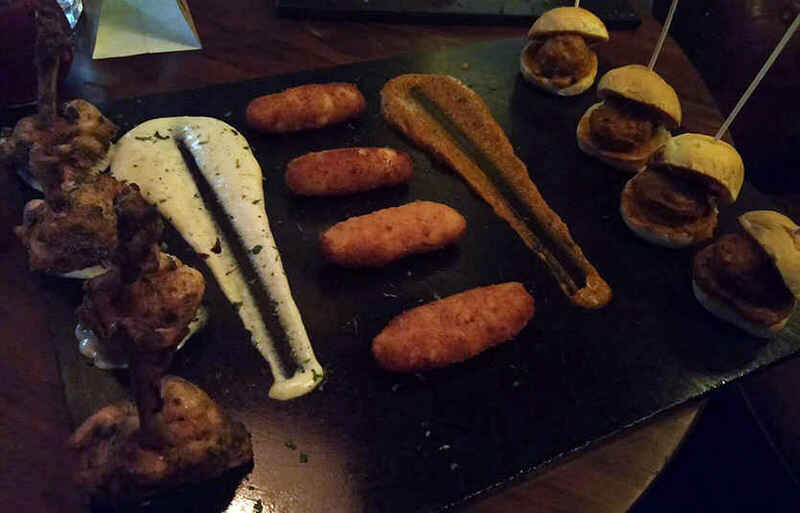 Topping off our foodie extravaganza, we then happily dug into their Chicken Barcelona! Thick hunks of tender chicken slow-marinated in barcelona sauce, their steak was cooked in red wine and carefully char-grilled to ensure a warm, earthy riot of flavour with every bite! There’s more - heavenly marinated little balls of pureed potatoes (baked) covered with zesty herbs accompanied this mammoth platter! We were the, finally and undeniably full to the brim! Being die-hard Sangria lovers, we then ordered our staple potion of choice, and while sipping on those tall glasses of red wine, sampled their Ham Croquetas - a deep-fried, buttery concoction of stuffed ham that was absolute heaven! Seriously, you need to go devour these when you&apos;re next at Informal. The last stop on our veggie trail was our favorite - Dahi Ke Sholey! The best finger food you can get your hands on, this one was made up of copious amounts of hung curd and a chopped-up mixture of bell peppers - all held together by sinfully deep-fried bread of course!